We got our camera back, y'all! So for a while, you might be seeing posts about Christmas and be all, whaa, wasn't that SO long ago? Yes. It was. But fun stuff happened around Christmas, so we're going to post all that old stuff anyhow. 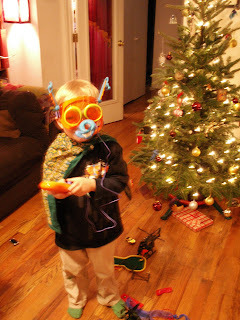 Melanie and Jason gave him that mask (with voice modulator and mix-and-match antennae/googly eyes) for Christmas and he wore it for days and days... He wore it on the train, in the snow, in the rain, in the car, and on the Chinatown bus. It was an awesome gift.